If you’re an amateur bird watcher, you no doubt have a few tools in your bird-watching arsenal. The National Geographic Field Guide or The Sibley Guide To Birds, a good set of binoculars, WhatBird.com on your bookmarks bar, and now, iBird Explorer Plus—or one of its related regional guides—in your pocket. The Word on Birds: iBird Explorer Plus’ top-notch database puts a birding field guide right inside your pocket. iBird Explorer Plus is an extensive, full-featured, iPhone-sized field guide to every species of bird in North America that’s based on and uses data from Mitch Waite’s excellent WhatBird.com Web site. The program provides a very easy-to-use “browser” interface for finding birds you know, which allows you to search for birds based upon their first, last, or family names. There’s also a powerful tool for figuring out the names of birds you’ve seen but don’t yet know. To use this tool you search for specific features such as the bird’s bill and body shape, color, size, and the location where you saw the bird. While this tool is very powerful, it can also be overwhelming to the rank amateur who may feel compelled to fill each field with information, thus filtering his bird choices down to zero. (Yes, I speak from experience.) For most users, iBird’s main browser interface is sufficient. When you select a bird to view, iBird displays a drawing of the bird along with 10 buttons at the bottom of the window for accessing detailed facts about the bird, a map of the bird’s range, information on how to identify the bird in the field, photos, interesting facts, links to similar birds, favorites, and a button to play a recording of the bird’s call. I found this last feature quite useful, and it’s loud enough on the iPhone to use to attract other birds. Tapping the screen once hides these buttons, giving you a full view of the drawing or photograph and more screen space for reading the bird’s identification information. The textual information available within iBird to help you identify and learn about the birds you’ve seen goes well beyond anything you’ll find in any two or three field guides combined. Info at Your Fingertips: Besides a drawing of each bird, iBird Explorer Plus features 10 buttons (only eight are visible at one time) that let you get detailed facts on everything from the bird’s call to similar birds. The program’s drawings are large and quite good, but occasionally limited when compared to book-based field guides such as Sibley’s, which typically have drawings of both the male and female, juveniles, and occasionally seasonal differences in the birds. For example, I recently found a Yellow Shafted Northern Flicker in my yard. Sibley’s Guide included four drawings of the bird in flight, and two drawings each of both the male and female adults. The National Geographic Guide included three birds in flight and two full-body drawings, but no females. 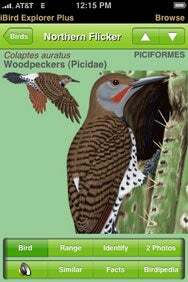 iBird had a drawing of one male bird in flight and another of the Flicker on a tree, plus two excellent photographs. But none of iBird’s images showed me the yellow coloring I had seen under the bird’s tail and wings. Fortunately, because iBird is a digital field guide, and updated very regularly, it’s likely that these issues will be rectified in a future release. My only other complaint about the program is that it currently provides no way for you to keep notes on the birds you’ve seen. Mr. Waite states that this features may appear in a future version of iBird Pro. This review focused on the $20 guide encompassing all of North America. Mitch Waite also offers five regional mobile guides for the west, south, North, midwest, and Canada priced at $10 each. A $5 version focuses solely on birds you’re likely to find in the backyards of North America. 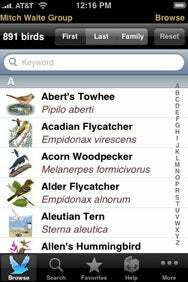 iBird Explorer Plus is compatible with any iPhone or iPod touch running the iPhone 2.1 software update.